FOSTER UPDATE: As the only pampered pooch for several years, due to a recent death in the family, Ginger needs a new home. She is a well-mannered greyhound that is leash trained, well behaved in the home, and is always sociable with humans and other dogs that she meets on her walks. She is house trained and will stand by the door to be let out. Ginger is an affectionate dog that enjoys being petted. She would do best in a home as the only dog. She is not cat tolerant but seems to get along with smaller dogs. Ginger is a mellow dog that doesn’t bark or cringe from loud noises, but she would prefer not to live in a home with small children due to the high activity level. Ginger’s former owners took exceptional care of this dog and, except for a little arthritis, that requires one pill a day, Ginger is healthy and current on her shots. 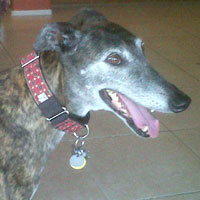 She would be a great companion for a first-time greyhound owner whose home most of the time.